Nationally certified sign language interpreter, advocate, and ally to the d/Deaf community. Proud CODA from 3 generations of deaf family. 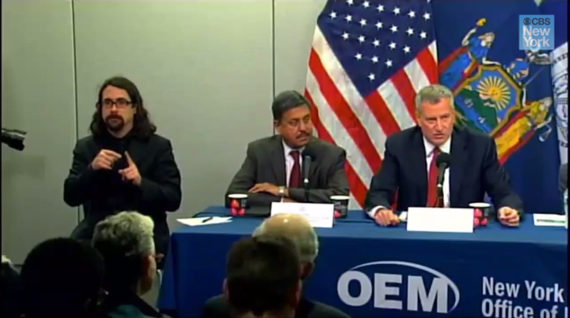 Last week, Mayor Bill de Blasio addressed the citizens of New York to discuss the city's first confirmed case of Ebola. During the press conference the mayor's ASL interpreter, Jonathan Lamberton, gained a bit of attention on the Internet. Most of the commentary centered around Lamberton's expressiveness, which is actually just part of sign language, but missed the most compelling aspect of this particular interpreter: he is Deaf. For hearing people who do not have any experience with Deaf culture, it might be hard to understand how Certified Deaf Interpreters (CDI) are used, and why they are necessary. In this instance, the CDI was working as a team with a hearing interpreter who sat in the audience. The hearing interpreter was signing the message to Lamberton, who was interpreting it on camera. But why have two interpreters? New York City is truly a melting pot with people of all ethnic backgrounds, education levels, and ability. In times when peoples' health or lives might be in danger, communication becomes absolutely critical. There is no room for miscommunication when state officials are addressing the public safety. Utilizing an interpreter whose native language is ASL can be a good match when your audience is unknown. While a high quality hearing interpreter may be able to do a great job, a CDI has the ability to reach ASL users on every level. This ensures that the message is conveyed to a broad audience. Deaf people who use sign language to communicate may read and write English quite well; or they may not know English at all. Many deaf people have excellent ASL skills, while others only know informal sign languages called "home signs." Additionally, in a large city like New York there is a whole audience of foreign born deaf people for whom ASL is a second language. Deaf interpreters come from a background of visual language, so they are able to "let go" of the English form more easily. Because sign language is their native language, deaf interpreters can communicate with deaf consumers on a level that other interpreters just may not be able to get to. CDIs tend to be more intuitive when it comes to foreign sign languages, informal signs, and translating cross cultural messages. Imagine you're an older person who immigrated here from Cambodia at a time when that country did not have any official sign language. The language you've used your whole life is a combination of signs and gestures which does not correlate in any way to ASL. A hearing sign language interpreter might have a very challenging time interpreting your doctor's appointment, finding it difficult to explain technical terms in a way you understand. Our ethical obligation as interpreters is to ensure the deaf consumer receives the service they deserve. This is one example where a CDI could be called in. Delivering health and safety information is an important role, not an entertainment event. It puts a lot of pressure on ASL interpreters when their performance is judged not only by deaf consumers, but by hearing audiences who have little understanding of the job at hand. During the press conference, one Twitter user claimed everyone around him believed the interpreter was "faking it" like the infamous Nelson Mandela memorial interpreter. 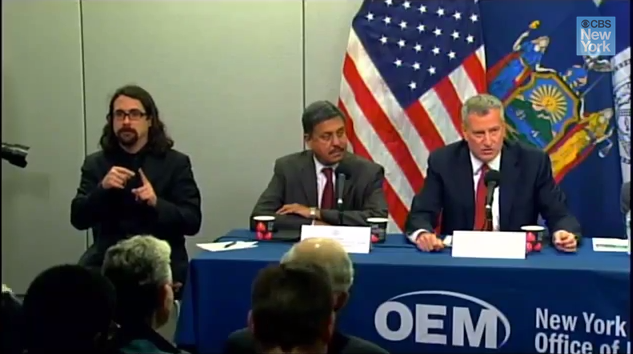 Other hearing commenters critiqued the deaf interpreter's signing style, as if he was putting on a show for them. When an interpreter's signing does not match the speaker's vocalizations, or the signing is very passionate, it does not mean the interpreter is making up a language or just acting. Sign language interpreters exist to serve the needs of deaf consumers in the best and most ethical way they are able. It's wonderful when sign language gets so much Internet attention, because it provides opportunities for mainstream society to become educated about Deaf culture. I think it is important that when general audiences to see ASL interpreters in the media, they understand the true function we serve.